Certainly there's a fine art to efficiently leading your visitors within your web site, to ensure that they understand just how much information is offered, and exactly where to locate the information you have to offer anytime they want to get it. The best method to create a website that's easy to browse is to never confuse the visitor: place items exactly where people would likely anticipate them being placed. This series of posts will examine web design standards for navigation structure. Without having some type of navigation, a website gives up any feeling of organization and structure. There are numerous ways of providing your navigation: down the left or right side of the display, at the top and/or bottom, or fixed in one location and visible regardless of where you scroll on a page. A good menu will present visitors an instant understanding of your website's content. Simply scanning your menu ought to offer them a suggestion of the things on offer and just what's here that they actually wish to discover. Offering a well-featured menu encourages the visitor that there's plenty to do and see, and motivates them to explore a bit. A site's navigation layout will often be accomplished by means of numerous layers of web links among pages. Primary navigation is normally found in a menu at the top of a page or on one side of a layout. It should typically contain four to ten top level links to your site's main pages. Secondary of sub-links should be groups of four or five under their logical parent in the primary links section. For instance, it's common to find "our management" and "our staff" nested under the "about us" tab. Don't forget that most of your website visitors will probably not land on your site through your homepage. In many instances, they will land on a secondary in your website from a specific search result. Consequently, they need to have the ability to find your navigation instantly. Secondary navigation will normally consist of customary links like copyright info, "contact us" and "about us." These kind of items ought to be omitted from your main menu, and positioned at the end of a page, leaving your primary navigation locations for the most important areas of your site. Internal links within the content of an article are an important means to link your pages with each other. Always link to the relevant page whenever you write about something that is discussed elsewhere in your site. This allows visitors to easily reach related content, which should encourage them to read more. 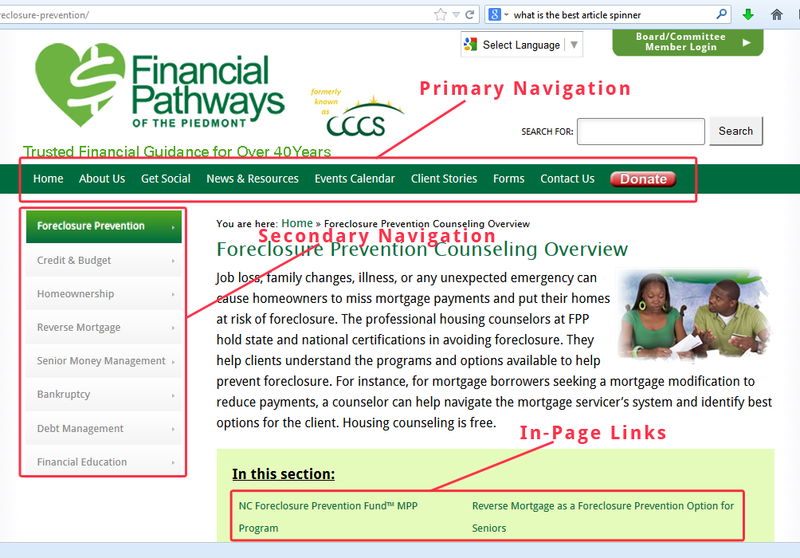 The link should be indicative of the intended page-- seldom use a link that says "click here." You should utilize the title tag and provide a short summary of the page's subject matter, which will enable visitors to determine if they wish to visit the related page.